The Rothco Outdoorsman Rucksack is a somewhat basic rucksack with multiple pockets, padded adjustable shoulder straps and a waist-strap for added support. 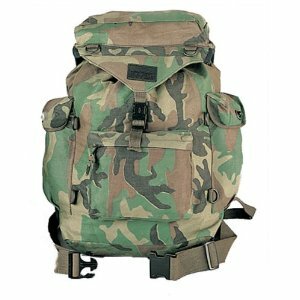 The Outdoorsman Rucksack is made almost completely of thin canvas material, with the exception of the straps and plastic buckles, which makes it light, but also a little less durable. It’s not delicate by any means, you can load quite a bit of weight into it without it faltering (I loaded my personal one up with 20lbs. worth of airsoft equipment and it didn’t seem to have any problems). Although, there’s a draw string underneath the flap at the top of the rucksack that you pull to close up the main compartment, and if you pull it to hard, it will start tearing into the fabric and cause it to fray. The Outdoorsman Rucksack has 4 compartments: a main one which basically makes up the whole rucksack, two smaller side pockets on either side, and one pocket right on the front of the rucksack. Unless you’re carrying a single, large item, the big main pocket is kind of a waste. Because the main compartment is literally just a big empty pocket, with no kind of sorting or smaller compartments inside it. So if you want to put a bunch of smaller things in there (duct-tape, airsoft BBs, books, food, whatever), they get all mixed up and smashed. A solution to this is to get a bunch of smaller bags/backpacks and place the smaller items in them, then put the bags into the big compartment. And the other 3 pockets aren’t even that big, nor do they have any type of sub-pockets, either. Another thing to note is that rucksacks and backpacks are different. A backpack holds its shape and stays high up on your back, they also have a bunch of smaller pockets to store little items in. But a rucksack, like the Outdoorsman, is more or less a fabric bag that has no shape and hangs low on your back unless you put a large object into it to give it some shape. That’s why rucksacks are meant for holding bigger items like sleeping bags or wood (that’s why the Outdoorsman has that big unorganized compartment that I mentioned). Rucksacks aren’t bad, they’re just meant for different purposes then backpacks. So, if you’re thinking about buying the Outdoorsman Rucksack, just make sure you actually do want a rucksack and not a backpack. Although, the large amount that the Outdoorsman Rucksack provides does come in handy. To give you an idea how much just the one big compartment will hold, deflated, the Intex Explorer 200 Inflatable Boat will fit with plenty of room to spare. Plus, you can stash another few small items in the other 3 pockets. All in all, the Outdoorsman is a fairly good rucksack. As long as you’re sure you want a rucksack, it’s durable and can hold a load of weight. The waist-strap and adjustable shoulder straps also let it fit very well. For the price of $15-$25, you really can’t go wrong.